Do I have the sweetest husband or what? Yesterday I came home from work to find this little beauty in my fridge. Yesterday was National Cheesecake Day and I was able to sample the new Stephanie's Ultimate Red Velvet Cheesecake from The Cheesecake Factory. When I first heard about this, I had hoped for red velvet cheesecake, but this new flavor consists of two layers of cheesecake and two layers of red velvet cake topped with cream cheese frosting. It's been quite a while since I've had a slice of cheesecake and it brought back memories of why cheesecake was my favorite dessert growing up. Has anyone tried this cheesecake yet? What do you think? I may not have kids yet, but I know that Yo Gabba Gabba is a GREAT kids show. I've watched it many times and frequently find one of their cute songs stuck in my head ("Jumpy Jump Jump"). Nick Jr.'s website has recipes that feature characters from their shows. I love the Yo Gabba Gabba cupcakes! Swirls Cupcakes saved the day! I was in need of some birthday treats for my husband and was short on time. Just hours before leaving for the birthday get-away, a box of Swirls Cupcakes showed up at my office. The first thing I noticed was how heavy the box was. I knew these were no ordinary cupcakes, they were heavy-duty! I'd heard a rumor that these cupcakes were better than Sprinkles. That's a tough name to live up to, but these cupcakes looked like they could do it! You should have seen the look on everyone's faces when I showed them the cupcakes that were coming along with us on our trip! We were sugared-up before we even got in the car. 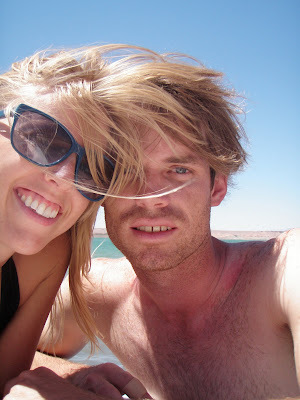 Not only did we eat the cupcakes on the drive to Lake Mead, we also ate them for breakfast, lunch, and dinner. I couldn't stop eating them, they were so good! The cake was moist, the frosting was creamy (not fake or too sugary), and the flavors were delicious. My favorites: Banana, Apple Strussel, Pina Colada, and Boston Creme. 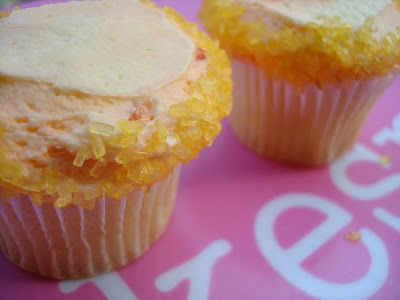 I am not normally someone who likes fruity cupcakes, but these cupcakes really won me over. 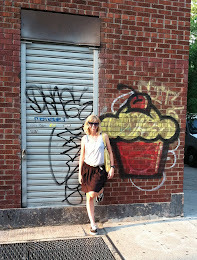 The Banana cupcake had creamy vanilla frosting on top of banana bread-like cake. I was really bummed that I had to share it with five other people. I overheard my brother say, "I think this frosting is the best I've ever had" (talking about the Red Velvet). He also really enjoyed the Chocolate Raspberry and Butterfinger. My husband favored the Chocolate Chocolate. He has always liked chocolate cupcakes best! There wasn't much left by the end of the weekend. My brother devoured the crumbs on the drive back home. So who is Swirls Cupcakes and how can you get ahold of their cupcakes? Swirls Cupcakes is a gourmet cupcake company that provides cupcakes for special events and delivers cupcakes to businesses. I spoke with the owner (Barry) who informed me that Swirls has recently been a part of many social events in LA. 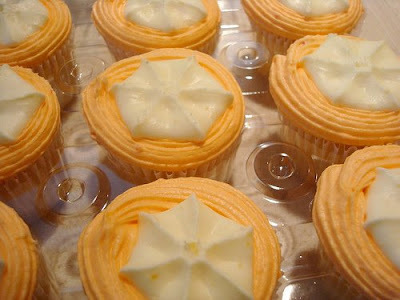 You can also order Swirls Cupcakes for your own personal events, such as weddings or parties. But Swirls Cupcakes are not just for special events, they also have a delivery route. They stop by office buildings, similar to the new Sprinkles Truck, except that they have a regular route. And the good news is that their route includes stops in Orange County! (You can even request to be put on their route!) How much better can it get? Great cupcakes delivered right to your office! Verdict: You must try Swirls Cupcakes! They are delicious! I was so surprised how amazing they were. Everyone agreed that we love Swirls Cupcakes! NOTE: Cupcake Take the Cake picked up this post. Check it out! Last year I went out on a limb and tried deep fried cupcakes at the OC Fair. They were surprisingly good! Well, the fair is back and I'm ready to get myself another deep fried cupcake. 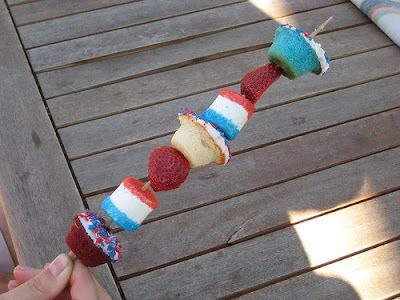 Has anyone seen them at the fair yet? Well, I don't actually have a golden ticket, but I sure do want one! In celebration of SusieCakes 3-year anniversary, each of their stores will be hiding 10 Golden Tickets in their cupcakes on Saturday, July 18th. All of the Golden Ticket winners will be entered into a drawing to win a year subscription to their Cake-of-the-Month club. 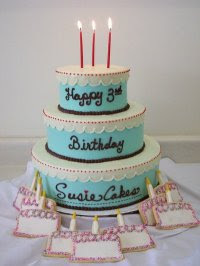 Life would be perfect if I got a free cake from SusieCakes every month. 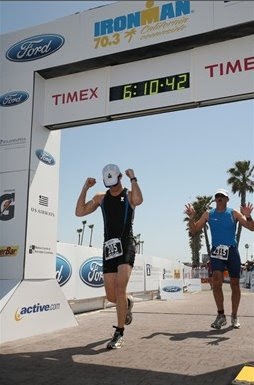 I plan on stopping by after I race in the OC Mud Run. 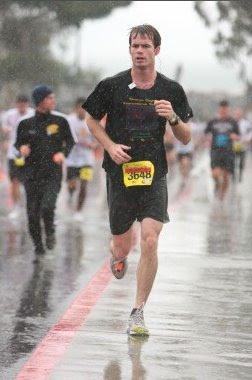 A cupcake will be my reward for running 10k covered in mud. They will be open from 10:00am until 7:00pm. Sorry Jill, but I am looking for a new BFF. And Sprinkles Cupcakes is at the top of the list. 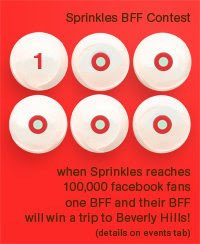 Sprinkles announced today (via Facebook) that they are hosting a contest to find their new BFF. So what do you get if you become Sprinkles' BFF? 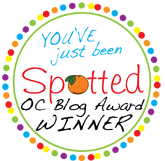 Sprinkles, if you are reading this, please note that you can save on the airfare if I win because I live in Orange County. 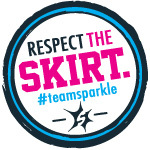 One more thing to note, Sprinkles will be picking a winner when they have 100,000 fans on Facebook. If I win, I will be taking Jill (my BFF-in-waiting) with me! A few months ago I posted about Tennessee T-Cakes, a dessert that Springwise thought would be a good alternative to cupcakes. Well, they are at it again. This time, they think it is gourmet churros that will replace cupcakes. Costco has the best churros I have ever tasted, as well as the best value. They sell for about $1.00 and you actually get double the amount of churro since it is twisted. But I digress, this article is about gourmet churros (or Spanish fritters). 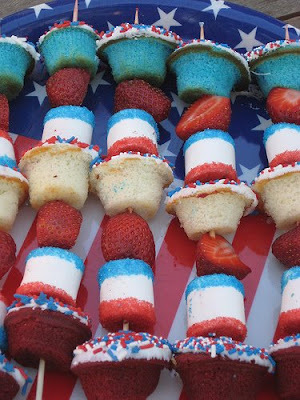 And boy do they look tasty! These fried treats are available at Xooro, which has two stores in southern California--Santa Monica and West Hollywood. And you should see the flavors that are available...Dulce de Leche, Chocolate Coconut, Maple Bacon, Raspberry, Turkish Hazelnut, Mango, the list goes on! 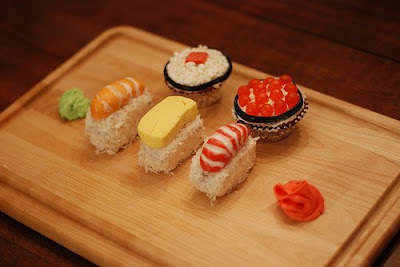 In honor of my husband's birthday today, here are some sushi cupcakes I found on flickr. Before I met my husband, I had never eaten sushi before. My first time meeting his dad was at a sushi bar. I managed to not gag in front of him. His dad said that I would love sushi in six months. Over five years later, I am still not a fan. But I do love edamame and crunch hand rolls. Maybe I could trick him with these cupcakes! Sprinklesmobile is on its way toward Hollywood's Walk of Fame! As I reported last week, Frostings is officially open! It took me a couple of days to get there, but last night the cupcakes at Frostings were given the Cupcake Activist's rigorous taste test. I picked out three of my favorite flavors (out of about 10 flavors available). Frostings has eight flavors that will be available every day and four flavors that will change, depending on the day of the week. First cupcake on the chopping block: Red Velvet. 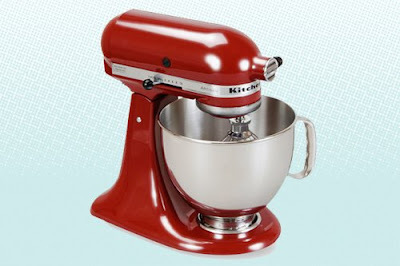 Red Velvet is a favorite for many people so it is important for a store to get this one right! I usually test this flavor when I am reviewing a new store. Plus, Foodie in Disguise highly recommended this flavor as his favorite. The Red Velvet did not disappoint! The red velvet cake was moist, but still solid. The cream cheese frosting had just the right amount of tangy cream cheese without being too sweet. The frosting was almost perfectly proportionate to the cupcake. It wasn't overhelming like the frosting on Sprinkles tends to be, but I could have used a tad more. Putting that tiny issue aside...delicious! I definitely highly recommend! Next up: Chocolate. I'm not a huge chocolate-chocolate cupcake fan, but I know my husband is, so I picked this cupcake to tempt him to share it with me. The frosting was milk chocolate and was very creamy. The chocolate cake was not as moist as the other two cupcakes. 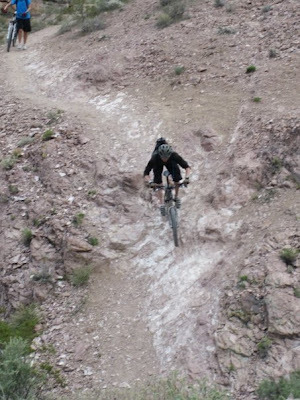 It also had a very slight bit of hardness around the edges. When I say slight, I mean, it was barely noticeable. I hate to even mention it, but as someone who is looking for cupcake perfection, I feel obligated to mention everything that I find. For all I know, I was just unlucky enough to get the one chocolate cupcake that was slightly imperfect. So what is my overall impression of the Chocolate cupcake? It was good, but not as great as the other two cupcakes. If you like chocolate, you should give it a try. It was a grade A cupcake, so I will still order it in the future. Plus, look how pretty it looks with those chocolate sprinkles! Last, but not least: Pumpkin. 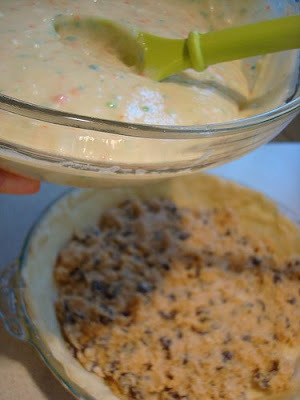 This flavor became one of my favorites during the holiday season. I don't see it much during the rest of the year, so I was excited to see it available at Frostings. The cream cheese frosting was the same as the Red Velvet's frostings. I love good cream cheese frosting. The cake was also equally as delicious as the frosting. 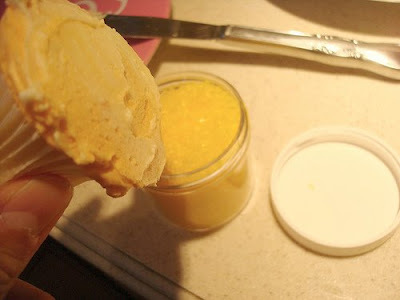 Pumpkin is such a wonderful flavor, especially paired with cream cheese. 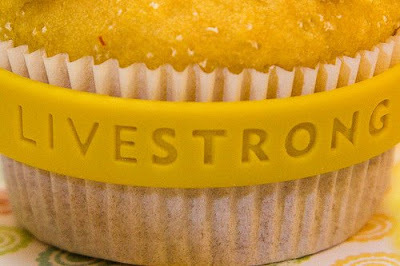 Thumbs up for this cupcake! 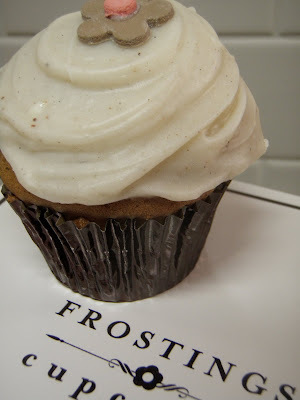 Let me mention a few other things about Frostings. First, their cupcakes have foil wrappers. I'm not sure why I like this, maybe it's because I haven't seen foil wrappers on cupcakes from anywhere else before. 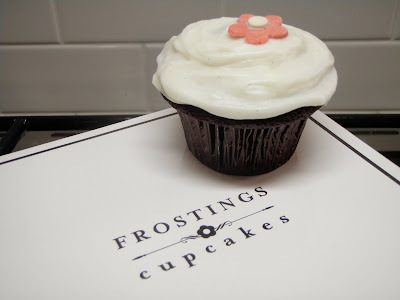 Frostings opens at 7:00am and serves breakfast cupcakes and beverages. I have always thought breakfast cupcakes are a great idea. I even suggested it for The Perfect Circle's Sweet Joe cupcake. I'm curious to see if this catches on. I've never seen any other cupcake store combine these items together like this before. If I lived closer, I would find it hard not to stop by every day for a cupcake and hot chocolate for breakfast. The to-go box and bags were perfect. The box had holes to hold the cupcakes in place. I hate it when the frosting gets crushed inside the box. Also, they put my to-go box in a nice bag. I'm happy to see that they were prepared with these items. 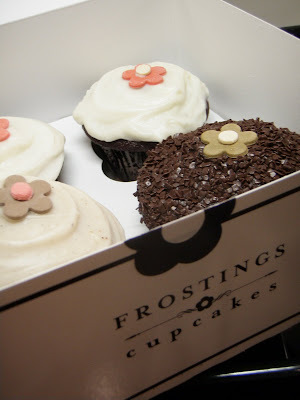 All of Frostings' cupcakes have a small flower piece on top. This is similar to the Sprinkles dot, EXCEPT Frostings' decoration is actually edible and tastes good. 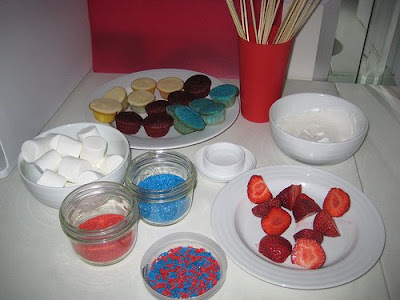 Everyone who tried these cupcakes made note of this, so it was definitely worth mentioning. 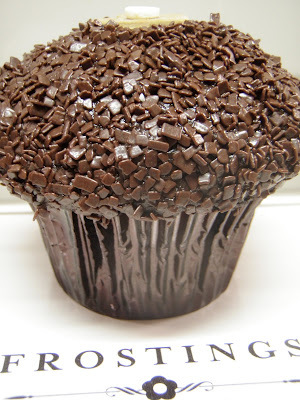 Frostings Cupcakes is located in Lake Forest, off El Toro Road. It is a little further away from my house than I would like, but lucky for me it is only one mile from my mother-in-laws house. Frostings will definitely become a pitstop every time I visit her. By the way, their cupcakes are $3.25 each. I really enjoyed my experience at Frostings. I was able to talk with one of the co-owners (John Frank) for a few minutes to talk about the store. He said their biggest problem is keeping up with the demand. That's always a good thing to hear. I think that Frostings will be very successful. 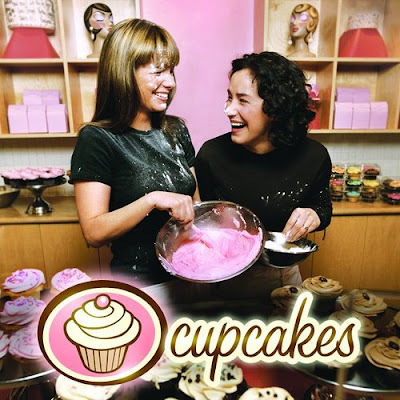 They have a good location (right off the freeway and no other cupcakeries near by), they have a nice-looking store, they have differentiated themselves by making breakfast a part of their brand, and they have great cupcakes. Good luck Frostings! I will back soon to try out more of your flavors! Pie...Tasty. Chocolate Chip Cookies...Delicious. Cake and Frosting...Yummy. 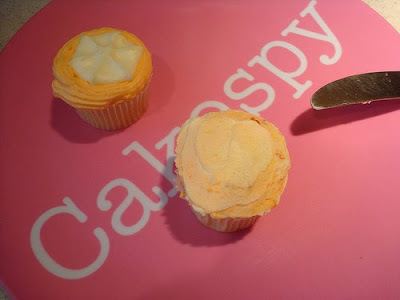 So what does CakeSpy do? 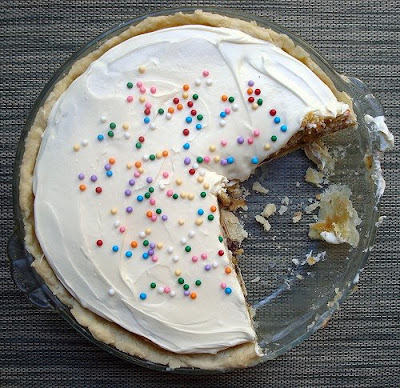 Combine all three desserts to make the Cookie Cake Pie! I don't even need to try this dessert to know that it is amazing!